This is the third in a series of Country/Cowboy books I read. Unfortunately, this book gets the lowest rating of the three. 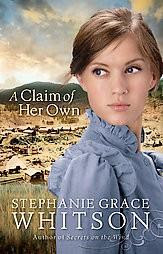 The story starts with a great premise: Mattie Flynn is joining her brother in Deadwood, South Dakota. She is on the run from someone in her past and believes she is going to start a new life with her brother. Unfortunately, things get worse before they get better. The story takes some typical themes from the times, miners fascination with ladies, saloons, and gunfights, all things that make western historical great. Aron's characters was well written and likable. There was even an appearance of Will Bill Hickok and Calamity Jane (very cool). I had several problems with this book. First, there is a Swedish character in the book and her dialogue is written phonetically (for instant the word what becomes vat). This became very annoying quickly as I had to keep stopping and re-reading the dialogue. Second, the ending left something to be desired. I was disappointed how the main conflict was resolved since it was very deus ex machina. The buildup didn't match the resolution. Third, this was a romance book, but there is very little romance between the two main characters. The subplot of two other characters has more romance in it. I thought it would have been better if there was a little more passion between Mattie and Aron. I hope her other books are more enjoyable for me.